My first Hasegawa review, the M3 Grant. BOX ART >> As usual, with the second everything is brighter, and it loses a bit of character. Although the image is sharper, the resulting colours are wrong, the green becomes too pale and makes it look strange. An old kit (first released in the 1970s) which still looks good to this day. Instructions are clear, it doesn't have too many pieces (59), can be built quickly, and it doesn't have any super small or super-complicated pieces. One of those models you enjoy making. As normally with Hasegawa, you get nice metal axles, that gives the model a sensation of die-cast once built (beware, as they are too long and they will have to be cut). 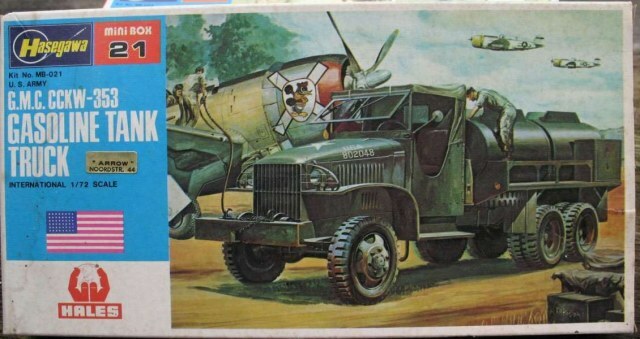 This is something that all model kits should have in my opinion, a good and functional model kit is doubly good. The bad? well, the chassis is slightly warped, so you will have to heat it slightly, or leave it under a big weight overnight to try and correct it. Perhaps the most notable setback of this model is that the engine seems too big in comparison with the wheels and the overall body, and it is also a bit more square than the real thing. I maybe like it better as the model is, but I can understand who says "that's an odd looking GMC!". 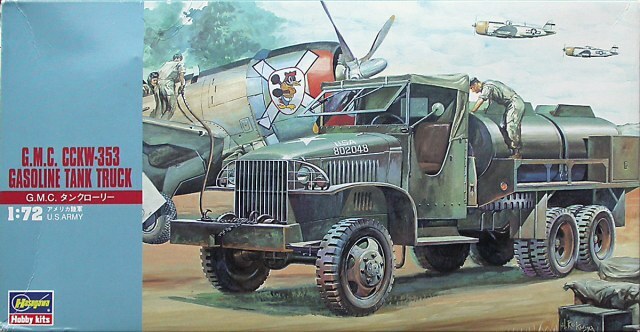 A driver and two crewmen are good extras, maybe some petrol cans/barrels would have been nice (such as Hasegawa gives with the Isuzu truck (plus a small wagon), but it seems that only their fellow Japanese get such treatment :) ). If you have bought the tanker version, I'll assume you don't want to reconvert it into a normal GMC or other GMC types, so we'll stick to this version, which leaves two choices, hence the 2.0 score. Besides green, you can paint it yellow. Although it is not the same version, it is just to give you an idea of how it would look more or less. You shouldn't have problems in getting it for around 10 GBP shipped, maybe less in retail stores or getting it in a eBay auction.